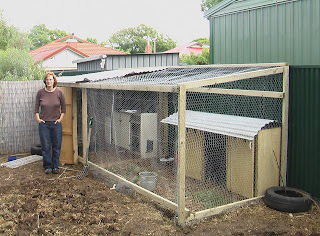 When I was first getting into keeping chickens, I did a lot of research about what type to build/buy. A-frame, chicken tractor, plain old shed, DIY or very very fancy, there are so many choices. The City Chicken website was my absolute go-to for information, pictures and ideas, I highly recommend them. I'm a firm believer in recycling / repurposing, and other than the wood for the frame and a roll of chickenwire, everything else was recycled. Hubby built three not-quite-square frames from permapine and we positioned them to form the beginning, middle and end of the pen. These were then joined together by long beams to get it stable against the fence. As you can see, the hen houses are old kitchen cabinets we had leftover from our re-fit. We used old tin sheeting from a shed we'd demolished a few years back, and an old wardrobe gave us the front door of the pen. 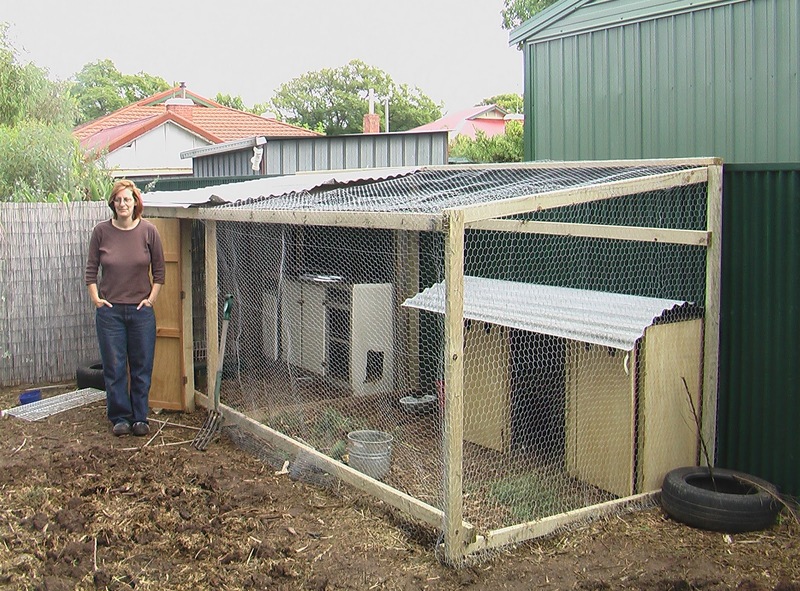 We remembered to position the hen houses before attaching the chickenwire - the job would have been much harder if we'd forgotten that! Old galv bucket = water container, old broken frying pan = food bowl. NOTE TO SELF - next time, make the roof higher. We wanted to keep the roof in line with the fence, so as not to bug our neighbour. Six months later he built a massive shed next door, and I get a sore neck every time I go into the coop..... Live and learn, hey?